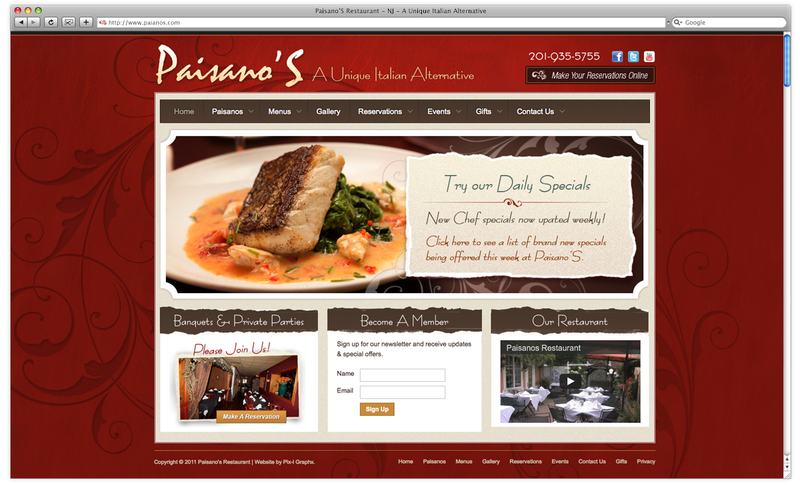 Paisano’s Restaurant came to us in need of a full website make over. They wanted a website with all the “bells and whistles.” Although they had a branded look, they really wanted to bring it out even more, from their website to everything presented at the location. Once the project was approved we started with a photo shoot of their location and food. If you own a restaurant, FOOD SELLS! Having high quality photography of your food is a must! One image can be the decision maker if a new customer should try the restaurant. Once wireframes and designs were approved we started development. The site was developed on one of the leading CMS platforms. The website including such things as newsletter signups, credit card transactions, reservation setups, galleries and rewards card signups to name a few. Needless to say the client was extremely happy and the website has become a powerful extension of the company’s brand and daily processes.